Recently, I attended the 5th Annual NGF Symposium. As in each preceding year, the content was timely and well presented. This is an annual meeting of leaders in the golf industry, mostly from the Pro and equipment side of the business. However, as we are all in this together, it’s the growth of the game that matters most to all of us, and that was the focus of this Symposium. Dr Joe Beditz, Greg Nathan and their staff put on a great program and what I want to address here is a new look at the numbers that are so often tossed about to describe the growth or lack of within golf. It is often said that the game of golf is losing participants and that is true. This is also automatically attributed to time and cost obstacles. However, Dr Beditz has done a detailed study on this and has determined that the golfers we are “losing” were not likely golfers at all. So who are we “losing”? Interesting and not too hard to categorize yourself and others. The survey conducted showed income levels across all 5 categories varied very little which means that if a person really likes the game, cost is not an issue. It follows that if a person really likes the game, time is not an issue either. These people, Nuts and Hooked find the fun, exercise, and challenges of golf to provide value that is worth the money and time. These are not the folks we are “losing”. The OK’s and Not’s are those folks. Usually, they are introduced to the game by a relative and/or friend and as might be expected the experience is miserable. Not fun to pay for the opportunity to make a fool of oneself and being unable to make reasonable contact with the ball with any consistency. It’s unlikely that the Ok’s or Not’s will be easily convinced that the value is there. However, it is not a stretch to believe that the Fun’s can be converted to Hooked at a minimum. The simple truth is that we, as industry partners, need to look for creative ways to improve the experience for the Fun golfers. There are some 20 million of these folks. It is not hard to see the potential, within reach, to significantly expand the number of participants enjoying our great sport. I will follow with a subsequent blog on some ideas that are working for others. How many times have you heard that or even suggested it? Of course, it’s fun to see how you would do but you will not be playing the course the way it was designed, unless of course you are a very low handicapper. My point of this blog is to again highlight the barriers to golf’s growth: Accessibility, Time, and Difficulty. In this case the focus is on difficulty and the trend over the past 20 years to build “monsters”, the development of which I am convinced is totally related to ego of the architect and/or owner. In my last blog, I mentioned a meeting with Mr. John Bryan, Vice President of U.S. Kids Golf. At the January PGA show, these folks had available a chart showing the appropriate course yardage for a player, based on a golfer’s driver carry distance. I have attached the chart at the bottom of this blog entry for you to see. This chart was developed after a lot of research and while it is geared to promote U.S. 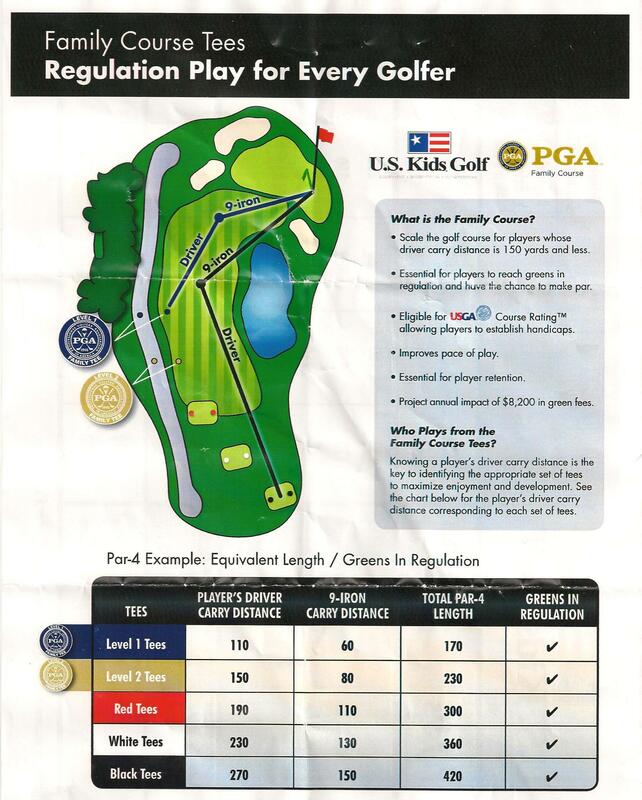 Kids Family Course markings, I think it is interesting when considering course development. A PGA Tour player, figuring Driver Carry Distance of 270 yards is just fine with a 7,300 yard layout. However if your carry distance (before any roll) is 230 yards, an appropriate course yardage for you is just under 6,300 yards. If 190 yard carry, 5,200 yards is the right distance. Wow. No wonder I struggle mightily on the “monsters”. Now my hunch is that over 70% of golfers are playing courses over their ability and this would certainly add to the frustration with difficulty, whether perception or reality. I am in that group.